IN BEAUTIFUL, CRUMBLING OLD Havana, detective Mike Ellis hopes the sun and sand will save his troubled marriage. He doesn t yet know that it's dead in the water, much like the little Cuban boy last seen begging the couple for a few pesos on the world famous Malecon. For Inspector Ricardo Ramirez, head of the Havana Major Crimes Unit, arresting Ellis isn t the problem the law is. He has only seventy-two hours to secure an indictment and prevent a vicious killer from leaving the island. And Ramirez has his own troubles. He's dying of the same dementia that killed his grandmother, an incurable disease that makes him see the ghosts of victims of his unsolved cases. 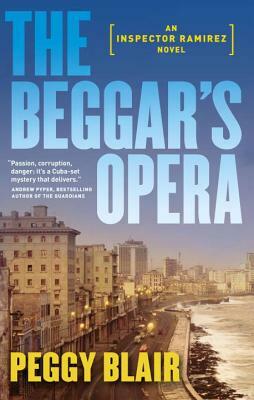 As he races against time, the dead haunt his every step. . . .
First in a new series featuring Inspector Ramirez, "The Beggar's Opera" exposes the bureaucracy, corruption, and beauty of Hemingway's Havana. Peggy Blair was a lawyer for more than thirty years. A recognized expert in Aboriginal law, she worked as both a criminal defence lawyer and Crown prosecutor. Her critically acclaimed mystery "The Beggar s Opera," won the 2012 Scotiabank Giller Prize Readers' Choice award and was selected as one of Amazon's best books in 2012. She lives in Ottawa."